On the menu today is buttermilk pancakes, butter and real maple syrup. Topped with angelic butterflies for your pleasure! Recipe: To your favorite pancake mix add 1 grated apple (Golden Delicious or Gala preferred). Add 1 tsp vanilla, dash of cinnamon, water & a little milk, and 1 tbsp vegetable oi. Let thicken up a few minutes. Heat an iron skillet (gotta be iron skillet). Heat skillet until nice and hot, add a touch of butter to pan and immediately drop spoons of apple/pancake mix onto pan. When the bubbles get inverted, flip the pancakes, count to 3 and remove. 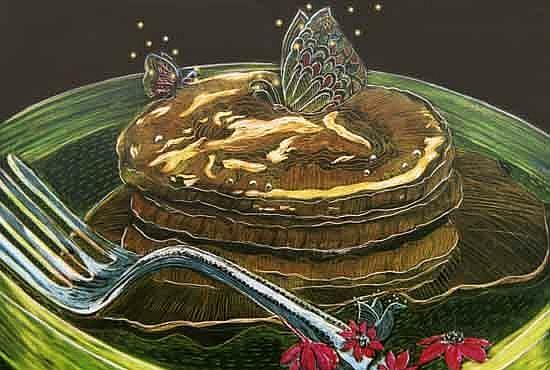 Top with maple syrup, more butter if allowed, make a wish and hope the butterflies will appear!